The best news organization in the world, backed by a billion-dollar trust, will lay off 250 workers. Last week brought the distressing news of massive lay-offs at The Guardian, which is possibly the best news organization in the world right now. 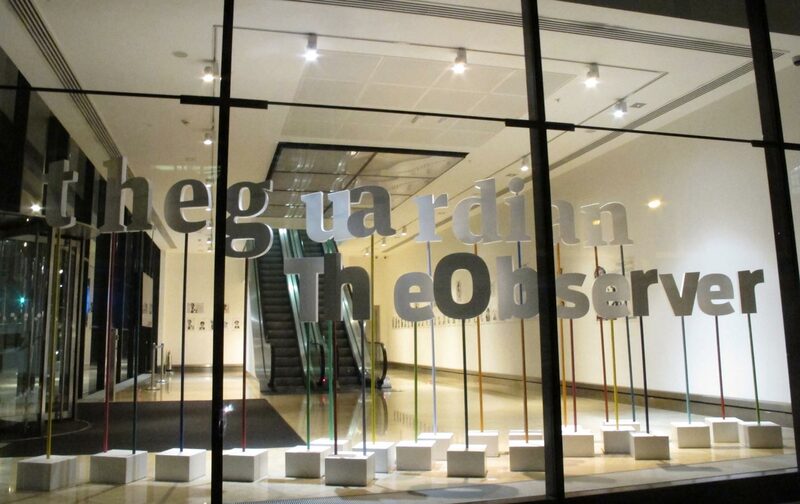 Management announced with apparently sincere regret that The Guardian and its sister paper, The Observer, will cut 100 editorial jobs, plus another 150 support jobs—mainly, it’s hoped, through retirement and other semi-voluntary measures. Considering that the total editorial staff at the two papers numbers 750, this means that roughly one out of every seven editorial employees will go, mostly from the London office. These and other cost-cutting moves are compelled by “the volatile media environment” facing news organizations today, announced Katharine Viner, The Guardian’s editor-in-chief. Disclosure: I consider the people in danger of losing their jobs at The Guardian my colleagues, and this financial belt-tightening will also affect what I and other freelance contributors get paid. But these facts should not disqualify me from issuing a “tough love” plea to everyone reading this and all the organizations, communities, and networks you are part of: Please don’t be a free rider—help pay for the journalism you read, watch, or otherwise consume. I say that The Guardian is the best news organization in the world at the moment not just because of its exemplary environmental news coverage, or its smart combination of deep reporting and spot news coverage, or its recently expanded focus on US news. What’s especially valuable is The Guardian’s long history of standing up to power and privilege in a way that most US news organizations no longer do. It’s no accident that Edward Snowden went public with his expose of warrantless surveillance in The Guardian, rather than, say, The New York Times. Snowden explained that he didn’t trust the Times after the paper’s editors acceded to the George W. Bush administration’s demand in 2004 not to publish an article by James Risen and Eric Lichtblau that began to reveal the administration’s surveillance activities. Only a year later—after Bush was re-elected—did the Times publish their reporters’ story. “Hiding that story changed history,” Snowden exclaimed. The Guardian’s financial troubles are emblematic of a broader trend that demands attention. Everyone who believes that an informed public is essential to democratic governance should be concerned about the fate of not only The Guardian but serious news outlets in general. If these outlets can’t stay in business, where will people turn to get the information, analysis, and debate needed to form one’s opinion, cast one’s vote, and otherwise perform one’s duty as a citizen? It’s no accident that Edward Snowden went public with his expose of warrantless surveillance in The Guardian. There is no single reason for the economic troubles challenging serious news operations these days, but surely a major factor is that most people—even people who should know better—assume that they no longer have to pay for journalism. Journalism is now considered to be a free good, especially when it appears online. Well, guess what? Real journalism—the kind that does original, even investigative, reporting of actual events out in the world and that seeks to hold politicians, corporations, and other powerful interests accountable—costs real money, even when it’s published online. Stephen Glover alludes to this conundrum in a stern critique of The Guardian’s dilemma published by the British website The Prospect (not to be confused with The American Prospect in the US). Glover’s piece is worth reading, both because he obviously did a good deal of reporting for it and his years as a media columnist and a founder of The Independent in 1986 arm him with insider knowledge of the financial requirements of a modern newspaper. Glover blames The Guardian’s problems on its own business decisions—or, more precisely, the decisions of Alan Rusbridger, the paper’s editor-in-chief for 20 years before retiring in May 2015. Rusbridger was a spendthrift, Glover charges—too eager to staff new bureaus in the United States and occupy fancy offices in London. Rusbridger’s greatest error, however, according to Glover, was to bet the paper’s future on digital rather than print but then decide not to charge readers for online content. Is The Guardian’s “policy of putting all its journalistic material online without charging readers…commercially unviable?” Glover asks. “Could the free model be fatally flawed? There are good reasons for thinking so.” Not least among those reasons: Rusbridger left his successor an operation that was losing £58.6 million ($84.7 million) a year by 2015. Rusbridger left his successor an operation that was losing 58.6 million pounds. The Guardian is in the enviable position of being supported by the Scott Trust Limited, a foundation established by the newspaper’s family owners in 1936 to assure The Guardian’s long-term financial health and journalistic independence. The Trust’s assets available to the Guardian Media Group were worth £740 million ($1.1 billion) as of January 2016, calculates Glover. Which sounds like a sizable “fighting fund,” he observes with a trace of schadenfreude, until one considers that the operation “burned through” almost half that amount over the past 10 years. I don’t pretend to know the ins and outs of The Guardian’s recent financial decisions, and every management team makes its share of mistakes. But the overriding issue, it seems to me, is getting people to pay for the journalism they consume. How is any company supposed to pay its employees, keep the lights on, and do everything else needed to stay in business if its customers stop paying for its products? In theory, advertising could help make up the difference. But readers’ failure to pay for the product in turn increases advertisers’ bargaining leverage and diminishes that revenue stream as well. Me, I pay $50 a year to be a Guardian Member. A subscription to The Nation costs even less (or if you already subscribe, you can donate). I even pay for an online subscription to the Times, despite my frequent frustrations with this country’s paper of record. But these are just options—pick the outlets you prefer. The point is, please chip in somewhere, and talk to friends, family, and co-workers about doing the same. Or pretty soon there won’t be any newspapers or journalists left. I don’t want to leave the impression that free riders are the only problem here: We journalists also bear some responsibility. We have not done a good enough job of making the case to the public about why they should pay for our work. At least not yet we haven’t, despite good intentions and some concrete attempts. But we had better figure it out, and fast, or serious journalism is going to go the way of chamber music: It may still exist in the culture, but only in rarefied circles underwritten by aging elites. Which is no recipe for journalism’s survival, much less for journalism regaining the social and political relevancy democracy requires.